In this edition John answers questions on the Irish record for points in a game against Wales, the Fagan brothers and Springboks with four wins over the All Blacks in a calendar year. At the time of the 1881 British census both were living in Tiverton in Devon and both recorded that their place of birth was Calcutta, India. George (born 1859) was educated at Rugby School and Kingstown School and it was as a schoolboy that he was brought in at the last-minute to play for Ireland against England in Dublin in 1878 - the first international staged at Lansdowne Road. He later studied at Trinity College, Dublin, but never played rugby for either the University's first or second XVs. 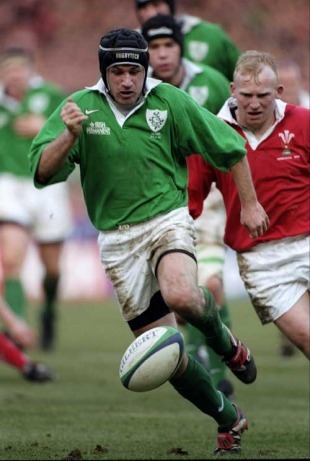 He is recorded as a member of the Phoenix Club in Dublin which played in the city's Phoenix Park and quickly became prominent in Irish rugby circles. Contemporary reports say that he was a prodigious drop-kicker. "It did not matter where he was or what the angle or distance inside of fifty yards, he always dropped a goal," wrote Jacques MacCarthy, the prominent 19th century Irish rugby critic. In his sole appearance for Ireland Fagan nearly dropped a goal, an English hand touching the ball in flight invalidating the score. Although half-backs did not specialise in his day, he was also credited with being the first player to use the tactic of following the ball around the scrum and harassing the opposing half-back as it emerged. He died young in the mid-1880s. The younger brother, Arthur, was born in 1862 and studied medicine at Guy's Hospital. He played club rugby for the United Hospitals, Tiverton and Richmond and appeared for both Middlesex and Devon in county matches. He won his England cap against Ireland in 1887 as a threequarter. England were excluded from the International Championship in 1888, the Celtic fringe taking exception to the RFU's stance on representation on the newly-formed International Board. England nevertheless selected a XV of so-called "paper caps" and Fagan was named as the fullback in the team that never was. He was still living in Devon in the 1890s but moved to London around the turn of the century. He died in Highgate in 1930, aged 67. The 1908-09 Wallabies had an intense December programme during the final part of the Welsh leg of their tour, playing six games in eleven days: Glamorgan League (17th), Newport (19th), Abertillery (21st), North Glamorgan (24th), Swansea (26th) and Cardiff (28th). The match on Christmas Eve against North Glamorgan was played at Merthyr's Penydarren Park where the tourists won 13-5. The match is sometimes omitted from Australian histories. Ernest Booth, the famous New Zealand back who had toured with the 1905 Original All Blacks, covered the tour as a journalist and sent detailed reports back to the Sydney-based Referee sporting newspaper. Booth wrote: "The match at Merthyr, which was really a bye game hardly attached to the tour, [was] played by really a non-representative team. Several Cardiff players assisted the Australians, and, in short, the whole affair was simply a day's outing for those who were to be non-players in the ensuing Swansea match. Eighteen selected men left for Swansea in order to get used to the ground." Willie Spiller (later a distinguished Welsh threequarter) and Fred Smith (a policeman stationed with Spiller at Canton in Cardiff) were Cardiff regulars. Gunnan, McCarthy and Lewis were the other "borrowed" players. Carroll (2) and Parkinson scored tries for the tourists and Carmichael converted two. Vaughan scored a try which was converted by fullback Thomas for North Glamorgan. The home side comprised mainly players from the Pontypridd, Mountain Ash and Maesteg clubs. Their outside-half was Wyndham Jones who had helped Wales to the Triple Crown against Ireland in 1905. Wing Roy McGregor (Pontypridd & Edinburgh University) and forward Dai Watts (Maesteg) were later capped by Scotland and Wales respectively. Scrum-half Johnny Quirke (and Willie-John McBride and Ray McLoughlin) were among nine new Irish caps against England at Twickenham in February 1962. Ireland lost 16-0 on a day when England's Richard Sharp had an outstanding game. Quirke was 17½ when he made his debut. He was noted for the speed and length of his pass and pipped the 1959 Lion, Andy Mulligan, to the No.9 shirt in the Irish side for that match. The youngest player to date in the International Championship was another Irishman, out-half Frank Hewitt, who was 17 years, 157 days when he steered Ireland to victory at Cardiff Arms Park in March 1924. Hewitt was just over a month younger than the previous record-holder in the Championship, Willie Neilson of Scotland, who dropped a goal on his debut against Wales in 1891 when aged 17 years, 201 days. Two Scots, Charles Reid and Ninian Finlay (both 17 years, 36 days), were younger when they won their first caps for Scotland, while Leslie Balfour was capped for Scotland a month before his 18th birthday in 1872. Balfour had been selected for rugby's inaugural international match in 1871, but had had to withdraw owing to a dog-bite. These three, however, played in the days before the International Championship began. Kenneth MacLeod was 17 when he played for Scotland against the 1905 All Blacks but had just celebrated his 18th birthday when he made his Championship debut against Wales later the same season. There is evidence to suggest that his headmaster at Fettes College was approached as early as 1903 about releasing MacLeod for the international against Wales. MacLeod was then approaching his 16th birthday, but permission was not granted and he wasn't selected. There has been no 17-year-old capped by England, Wales or France to date. Norman Biggs, the youngest Welsh cap, was 18 years, 49 days when he played against the New Zealand Native team in December 1888. Tom Prydie will be 18 on 23rd February. When Quirke was first capped by Ireland in the early 1960s, it is interesting to note that WRU byelaws then prohibited anyone under the age of 18 from playing first-class rugby for a Welsh club. Eight South Africans achieved the distinction of playing in four Test victories in the same year against the Springboks: Jack van der Schyff; Tjol Lategan; Cecil Moss; Hannes Brewis; Okey Geffin; Jorrie Jordaan; Bubbles Koch and Hennie Muller. They were members of the South African side that whitewashed the All Blacks 4-0 in the 1949 Test series. None, however, managed a fifth win with a provincial side. Ryk van Schoor, who had been overlooked for the first Test, played for the winning Rhodesia side against those 1949 All Blacks and forced his way into the Springbok team for the three subsequent winning Tests. The first South Africans who clocked up four wins against the All Blacks in the same year were Jackie Tindall, Bennie Osler, Phil Mostert and George Daneel (two Test wins and two provincial wins each) against the 1928 New Zealand tourists. Mostert led three of those winning teams - South Africa (in the first and third Tests) and Western Province (in the week before the fourth and final Test). Bennie Osler led the Western Province Town clubs who beat New Zealand 7-3 at Newlands in the second game of that year's tour. Looking at tries conceded over the past five seasons, England enjoy the best defensive record, leaking on average only 1.32 tries per game. Ireland, the current Grand Slam champions are second with 1.48 tries conceded per game. Italy prop up the table with just over three-and-a-half tries a game on average scored against them.